The first couple weekends of duck season provide plenty of shooting via summer-softened ducks. Hunting pressure on the average waterfowl marsh, especially public water, seems to fall away like leaves on bank-side trees as the season progresses—especially as temperatures plummet. Ruark’s “Old Man” remarked that you had to be crazy to be a duck hunter, as “foul” weather also spells “fowl” weather. Pull on your heaviest neoprene waders, flip down the ear flaps of your favorite duck hat, and enjoy the best duck hunting of the season. You’re pursuing birds that have been ducking pellets from Canada to the Gulf of Mexico. These aren’t the witless local birds of opening week. They’re battle hardened. Those haphazard decoy spreads that worked during earlier dates won’t get the job done now. Sure, you’ll get fly-bys but very few webbed feet reaching for water. A little more attention to detail, and generally a tad bit more work, is needed. While there will certainly be some mallards about the average marsh, there’s also just as likely a pod of green-wing teal, or gadwall, pintail, and widgeon; not to mention the assorted “trash” ducks such as mergansers, ruddy ducks, and buffleheads. Realistic spreads should include a good mix of assorted species—each set according to natural habit (teal in shallow, still water; divers in deeper pools). Confidence decoys are also an important part of this program. Great blue herons, snowy egrets, gulls, coots, and even crows are all part of any natural marsh setting. All of these species are commercially available and add realism to your duck spread. These finishing touches can make the difference between in-your-face shooting and low-odds pass shooting. Remember motion decoys. They’re so effective they’ve been outlawed in many states or timeframes, so check your state’s regulations to assure you don’t break the law. Some states specify only against motorized decoys, making a “jerk-cord” set-up highly viable. A floating decoy is attached to a rope threaded through an anchored pulley. Pulling the rope causes the decoy to pull under; releasing allowing it to bob back up, creating ripples and splashing. Where legal, nothing works better to bring ducks in close. When approaching a spread and lining out for a landing, they’re naturally drawn to open pockets of water that also provide an open approach lane. They always land into the wind. Use this information to direct traffic into your spreads for closer shots. Make it comfortable for them. Make it easy. Crowd areas that will result in longer shots—the far bank of a river, for instance—allowing for the closer pockets to be landing destinations. Take obstacles such as trees, river bends, and high banks into account. Remember, too, diver ducks will normally follow the outside line of a spread edge, making strings of decoys that lead ducks to your blind most effective. The key to successful decoying is placement. The best decoy spread known to man produces little...if ducks don’t want to be there. When weather turns rough during late seasons, waterfowl priorities change from obvious safety (from hunters) and food to shelter. Look for coves, ponds, or sloughs sheltered from roaring winds, even if it’s not a place that produces during earlier dates. This can be something as simple as a line of brush or low-laying sandbar, or something more obvious such as a cut bank or flooded timber. In fact, high winds can work to your advantage, forcing ducks tighter to shorelines where they become more vulnerable. When temperatures drop into the teens and below, your shallow-water potholes, sweet-water sloughs, and lake bays normally freeze. Ice isn’t appealing to waterfowl. Any small stream or easily-wadable river that remains open during hard freezes will attract waterfowl. In fact, even when large still water is available, late-season ducks flock to shallow, flowing waters to take advantage of easy food. Scouting assures the most productive hunts, finding holes that regularly attract ducks. I can’t explain it: Why one hole proves a regular duck magnet and another, mirroring its appearance, attracts little attention. Security is the biggest issue, meaning longer walks often net the best holes. Those more difficult to jump-shoot effectively (lack of high bank vegetation or cut banks) normally prove best for decoying, as ducks feel secure in such places. Ironically, I use jump shooting as an excuse for scouting out new rivers or creeks for decoying potential. Less is sometimes more in this setting. Late-season hunting is why we invest money in foul-weather gear. This is when chemical hand and toe warmers are bought by the case and stashed in every inside pocket while layering. A blind heater becomes a gathering place to thaw frozen fingers and set ice-rimmed retrievers steaming. I’ve long used a large but defunct minnow bucket, filled with self-starting charcoal and set ablaze even before dumping decoys out for tossing. It provides heat during the longest hunts and normally must be dunked to kill the live coals after limits are accumulated or hunters cry, "Uncle." Keep a close eye on your retriever. They can’t tell you they’ve had enough. If their enthusiasm wanes, they’re likely done. Don’t make them do anything they don’t want to on the most brutal days or when ice clogs waterways. Dogs get hypothermic, too. Zip them into a thick neoprene vest, and leave room beside the heater for them between fetches in icy water. I normally keep an old camouflaged sleeping bag on hand, actually wrapping my dog in it while waiting for the next wave of ducks (tying it off to a bank-side willow to assure it doesn’t go along on the next retrieve). I bring along plenty of high-calorie dog treats—bacon-grease-soaked biscuits were Kody’s favorites—to keep my dog’s internal furnace burning. A quick word of caution regarding hunting flowing water and your retriever: Keep a close eye on your pet in these situations, as super-chilled water and a sucking current can prove a bad combination for your faithful hunting companion. If conditions appear dangerous, especially if large ice flows are present, keep your dog leashed and fetch ducks with a boat. Depending on location, iced-up water doesn’t necessarily mean hunting’s out of the question. On New Mexico’s Middle Rio Grande, it was typical to find shallow marshes and sloughs locked tight in the mornings—ice that would disappear by lunchtime. This left ducks well out of reach on wide-open water, yet anxious to get out of wind and whitecaps. We created their apparent safe haven by arriving earlier than usual and kicking through ice to create open water. This normally involved slogging a wide circle, kicking and pushing through shin-barking ice. Depending on how big a piece of ice you are dealing with (determined by sheer ambition and available time), you might have to kick that circle of ice in half or quarters. Now using watertight, insulated gloves, push broken pieces beneath ice edges and out of the way. A gaggle of motion decoys (again where legal) really makes the day, keeping water moving and less prone to setting up immediately. 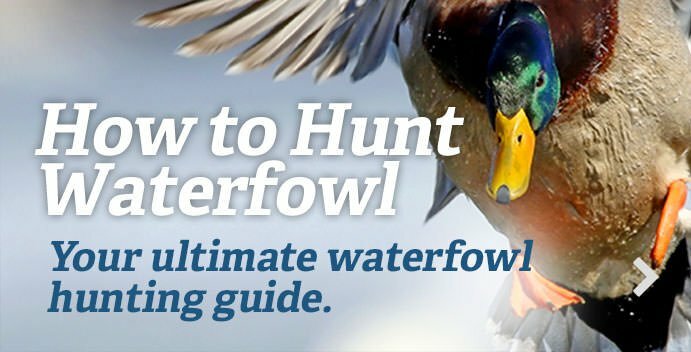 Late-season waterfowling simply can’t be beat. To me it’s the epitome of what duck hunting is all about. But it also happens to be pretty darn productive, as well.